Senior marketers cannot afford to let their skills and knowledge rust. They must scan the marketing environment constantly in order to discover what's new and relevant to the business they manage and to their own careers. They must be able to separate the “merely” new from the next big thing. The Levitt Group is an organisation of the most senior qualified members of the Chartered Institute of Marketing. It exists to separate valuable, relevant content from the hype, and deliver it to CIM members through events like the annual Five Great Minds conference. This conference brings together five experts to share their knowledge of entrepreneurship, risk management and leadership with the most experienced and senior members of the CIM. 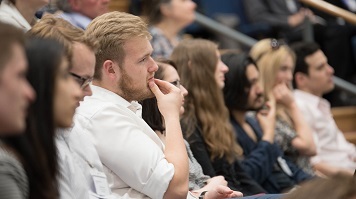 It is an opportunity to listen to and question experts at the forefront of their field, and a chance to engage with leading practitioners on the pressing issues the profession is facing today. The event is restricted to CIM Levitt Group members, but LSBU postgraduate students and academics are warmly invited to attend some or all the individual presentations listed in the programme below. Places are limited and demand is strong. Book early through the Eventbrite links below. All talks take place in Keyworth Lecture Theatre B. Book a place on this talk. Elmar Kutsch, Senior Lecturer in Risk Management, Cranfield School of Management. Find out more about the talks and the speakers (PDF File 129 KB).